I know. I just painted the cabinets a year and a half ago. And they look great! But I think I want to change them anyway. Okay, so this is a picture you might see me post of our kitchen. I took it with my phone on a very dreary, rainy day with all lights off. Then I did the normal photoshopping I do to most photos of the house – lots of lightening and brightening. It looks like such a bright, natural light-filled kitchen! See how DARK it is?! So dark. So dark that it’s bumming me out. 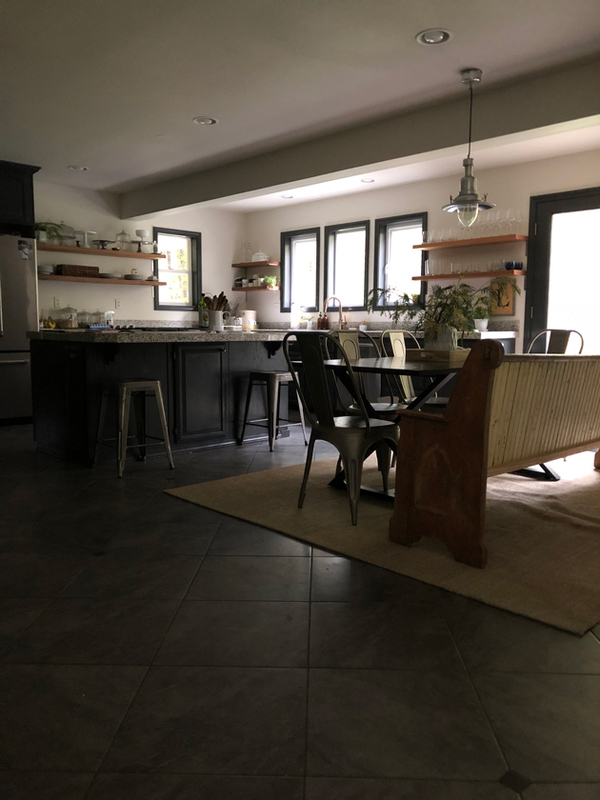 When we moved into the house in October 2017 our plan was to leave the kitchen alone until we did a full remodel – removing a wall, adding more windows, reorienting the kitchen and dining rooms. We were going to just live with the perfectly function, yet totally not our style kitchen for a few years. And then on our first night sleeping in the house I heard Ryan’s drill from the other room and knew just what he was up to. The upper cabinets just didn’t work for us. And that started a mini kitchen makeover. For about $1000 we transformed the dated space to something so handsome and functional (see that before and after post here). The biggest change was painting the cabinets. We went dark on the cabinets for a couple of reasons. I adore a white kitchen forever and always but because this was just a ‘in the meantime’ update, trying something totally different sounded fun. This house has pushed me in a more masculine direction with color choices. We needed to find a way to tie the dark gray tile floor in with the speckle-y granite tile. I would love to replace the counters and have seriously considered finding some sort of concrete-like skim coat product (is this such a thing?) to diy my way to something less speckle-y. We won’t fully replace the counters or floors until the full remodel which is still far-off so finding a way to make both of those elements work is essential. Shoji White for the walls, Iron Ore for the cabinets, trim and doors and the Peppercorn represents the tile floor (although once I got home from the paint store I realized that the floor is slightly lighter than Peppercorn. But you get the idea). It really does look nice. As long as it’s either super bright outside, all the lights are on or photoshop does it’s magic. So I’m feeling like I should try a new color on the cabinets to see if I can brighten up the space. Again, keep in mind that this is all just a big experiment with very little risk. We are not planning on keeping these cabinets long-term so I don’t mind painting another layer on them. And while I want them to look nice, they do not have to be perfect. This takes all the pressure off. Also? If the new color looks terrible, I can just paint them back. I should also mention that I find painting to be fairly enjoyable. Okay. So here’s what I’m thinking for color. I’d like to pull some of the taupy gray from the counters and warm things up. My initial thought was to use my favorite neutral warm gray – Revere Pewter by Benjamin Moore. We had it in our mudroom in the old house and it is the wall color up on the third floor (see it here). I painted a piece of paper and taped it up to the cabinet just to get an idea. I know it’s hard to tell from this photo. I didn’t do any post-processing to try to keep the colors as true as possible. I like the color; Ryan thinks it might be too light. And I see his point. We might want something a little richer to tie the floors and counters together. After the boys’ football game last weekend, I popped into the paint store to grab a few samples. The shoji white is our wall color, peppercorn is close to the floors and iron ore is what the cabinets are painted currently. I pulled the warm taupe-y grays that caught my eye. I was going to buy a few sample pots to bring home, but the Sherwin Williams lady told me they have another sale coming up next weekend and so I decided to wait (and save 40%!). So I just came home with the little paint chips. It’s kind of helpful to see the colors next to the counters. See that medium taupe in there? I think that’s the color I want to pull out. Fawn Brindle, Mega Greige, Shiitake and Agreeable Gray (which is a near-match to Revere Pewter). Here are the colors pulled from the Sherwin Williams website, which all feel way darker and browner than the paint chips. I’ll go in once the sale starts and grab a few sample pots to try out. It’s just too hard to choose a color based on tiny paint chips. Just to give see what it might look like to go lighter, I played around with photoshop. Truthfully, I don’t really love it. But I don’t hate it either. The dark cabinets will probably always be more photogenic and striking, but I’m more concerned with how the kitchen feels on a regular day and like I said up there, the dark is feeling so dark. The trim will stay the same for now (when we remodel we’ll replace it all with simple white trim) and so I don’t want the cabinets to clash. And I love the warm wood of the shelves so that needs to go with the new paint color, too. So that’s what I’m thinking. I need to find a color that feels brighter, works with the gray floor, speckle-y tile and dark trim, and ties in with the wood shelves. Am I crazy? Should I try it? (actually, don’t talk me out of it! I really want to see how they look lighter.) And which color should I pick? A really light but bright gray reminds me of you. Maybe leave the island alone? I understand the need to lighten things up and how grey can influence the mood. I am an educator and I see grey used lots in school buildings which seems so dreary and institutional. Just not friendly or happy like being in a room should feel. My mother-in-law is soon to move into our basement and has painted EVERYTHING a color similar to Rushing River – a medium grey. Ach! The cabinetry and every wall is INSTITUTIONAL grey! DREARY! Now, she is considering a pickled grey finished laminate for the floors! ARGH!!! So, while I would go lighter on your cabinets, I think I’d try to warm it up a bit with Fawn Brindle or Shitake and ALWAYS have flowers or brightful, cheerful, colorful accents in there! Have fun with your creative project. I do not have a strong opinion on your color choice options, but hope you find the balance you are looking for in your kitchen. I sooooo get it;) My mood is affected 110% by how light or bright my surroundings are. I can be literally paralyzed and completely unproductive when it is gloomy outside (not so great when I live in Chicagoland where it can be gray 6 months out of the year LOL!) We’ve painted kitchen cabinets and it completely changed the feel of the space. I know this is temporary until you can remodel, but IMHO would steer clear of muddy taupes. 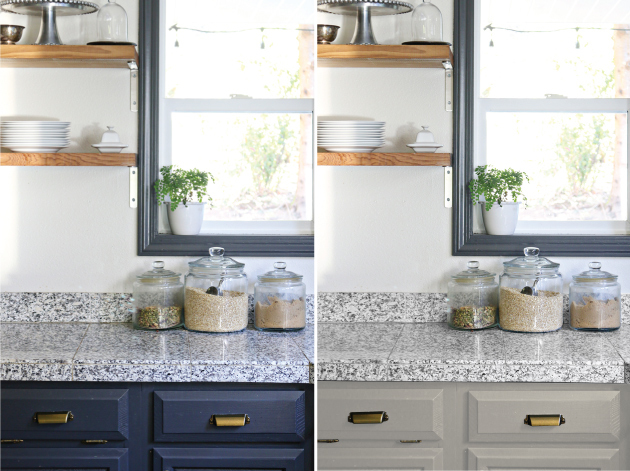 Only you can tell in your kitchen and in person, but the color you photoshopped leaned a little muddy if that makes sense;) I think a creamier tone that pulls out one of the lighter speckles in your countertops would pair nicely with the lightest tone in your floor tiles. All this being said, go with your gut. You have a great eye and whatever you choose will be great. Paint is such a game changer….good luck friend! Can’t wait to see what you come up with! You mentioned the countertops – I know there are like countertop paint kits and I’ve seen people just paint them. Not sure what kind of paint is used or if the kits might be what you’re looking for but maybe! I’ve considered it for my own dated and pitted laminate counters. I liked 3 that you chose:Fawn Brindle, Mega Greige, Shiitake. Dunno which I like best though. You crazy!! agreeable grey, that is my pick. I think it will look nice! not to brown. Maybe paint a larger piece of paper of and tape to the cabinet. That said, if you are anything like me, you are already painting your cabinets. LOL. I am excited to see what you do. You have lovely taste. Maybe it’s too soon to bail on the dark cabinets. Could use a rug or two in light colors to trick you into thinking the floor is lighter. Like a runner sort of rug between the counters and island in lighter tones. On another note, a paint color from sherwin Williams I’ve loved is Amazing Gray! It’s subtle and warm and rich. 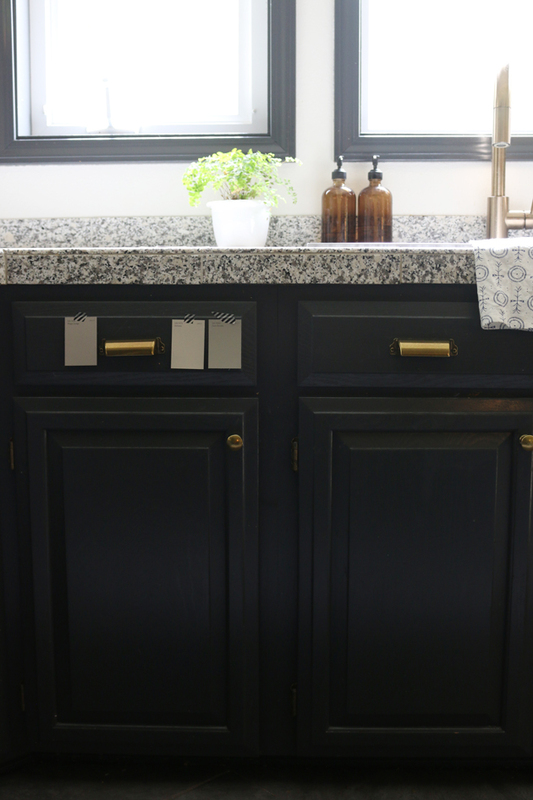 Another reader commented and I agree, I’d paint the cabinets the Shoji White so you don’t introduce another color, plus I think the brass hardware would still look great! What about leaving the island dark and painting the cabinets lighter? I love revere pewter but it is quite light. hard to know what colour without being in your house and seeing all the different lights. I think white cabinets would be very shocking in that kitchen…what about several shades lighter than iron ore (which I love btw) Then you’re still in the same tone as the island and what works with the counters and you could probably use the hardware. I agree with the island sentiments. Try it there first! Also, didn’t Young House Love to a concrete skim over their counters before their big remodel? May be worth checking into their archives for some tips. I just wanted to let you know we switched from an exclusively Sherwin Williams family to Behr from Home Depot. I read an article in Consumer Reports and Behr beat SW in every category. I didn’t believe it, as I’d had bad experiences with Behr in the past, but since we had to paint 2000 square feet, I was willing to try. They have changed their formula (last time I used Behr was at least fifteen years ago). The coverage is better and it’s easier to work with than SW. And you can NOT beat the price. They also do smaller sample pots and are so reasonable. Their everyday prices are better than the SW sales. They will color match any SW color, just give them the name or number. the colors you have are very lovely and sophisticated, your kitchen looks chic but I would try a large rug or floor cloth in a light shade with a touch of warm color to reflect some of the window light and give some warmth to your kitchen. I too have wanted to paint my cabinets and was considering milk paint in shades of blue and green so they look distressed. My kitchen is old and I don’t want to spend a lot to fix it up so I was considering the paint and maybe a floor cloth that I would make myself. I have worked with painters canvas with several coats of white paint with a stencil made from tracing ivy leaves for a floor cloth for a wedding. I would use a different theme for my kitchen. This project has been in my head but I have not yet had the courage to try it. It will be fun to see what changes you make. Edgecomb Gray is one of my favorite light Greige colors by Benjamin Moore. It is on the same paint chip strip as Revere Pewter. I was all set to paint the majority of our home RP when we moved. When we painted a large swath from the floor to ceiling it read completely green. Later a design friend shared that when you have lots of windows the trees from outside reflect color on the paint. I would have made a pretty costly mistake because I am a big fan of RP. So Edgecomb grey is lighter and just the right color for us. You might take a look. There is a lot of green outside so revere pewter could go too green. I’ll try a swatch of edgecomb! Hi Emily! A couple of years ago we painted our kitchen cabinets SW Analytical Grey and we love them! 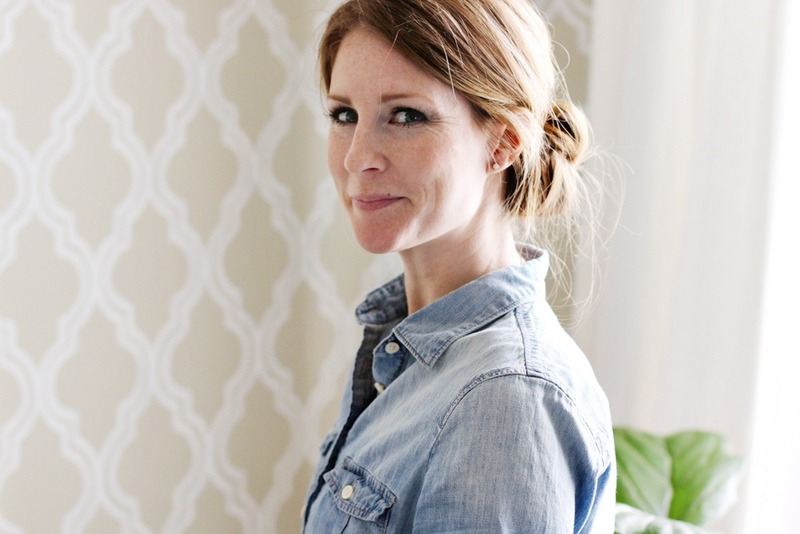 It’s the perfect warm neutral greige color that shifts throughout the day. It’s a kind of non-color color that I really like. We paired it with butcher block counters so it would look great with your open shelves. Mega Greige is my vote! I think the key is you enjoy painting and it would not be a hassle to you or the family. If the paint you choose is not too stinky I think go for it when kids are busy and you get right to work. Can’t wait to see it! Thank you for showing your unphoto- shopped picture too, it shows your house is just like the rest of us! We will eventually put wood floors throughout the downstairs and that will change the feel and warmth so much. I do agree that all of the black – the table, the chalkboard, the cabinets and trim are making things feel darker than they need. We tried painting the window trim white and it just looked cheap … which is why we went with the dark. I think bringing in a wood table instead of the black would help – but I hate to buy a new table just for the in-between time … hmm. I like that thought, though. I would go lighter than those! You say you love white, right? In the comparison shot, the granite with the Iron Ore has more white tone and the other is toned beige…each edited differently? My vote is to brighten with white/ivory & the brass hardware will pop! If you look at grey cabinets that you like, don’t they usually have white/light counter tops? I think that you would feel at home, happy, content with white/ivory. Just some thoughts, but whatever you do…it will be beautiful. You have the eye! We are getting ready to pour white concrete counter tops on our new owner build @daynaweir. Stay tuned! My advice is worth absolutely nothing because they all look like they have brown undertones to me. I would have headed for a “cleaner” grey similar to your moulding color family or grey/white. What I DO know is that you have an incredible eye and I love seeing your projects! Can’t wait to see the results on this one!!! We have Revere Pewter on our walls and it is very khaki like in our living room/kitchen. We do have white dove trim, cabinets, medium wood floor and a iron ore island. We have dark soapstone counter tops on the cabinets and grey speckled countertop on the island. I would try painting the island lighter and see if that works for you first before doing all the cabinets. I love the dark paint in your photos and wondered how it felt to live with that color, so I’m so glad you posted this…I was considering it for a bathroom cabinet. 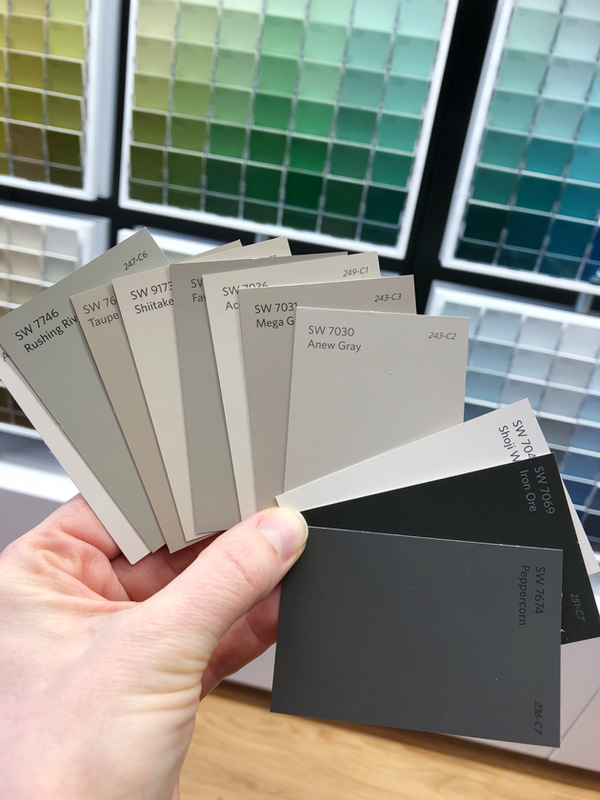 You seem to be a black and white and gray fan, so I would recommend a lighter gray to you from Sherwin Williams that we love in our house with our dark gray couch and dark gray drapes…Requisite Gray SW7023. We used SW Greek Villa for the trim, which seems close to Shoji white so maybe it would go? I can totally see why you’re missing your white with your personality, but I don’t think grey/beige in your kitchen is the solution. It is going to look muddy no matter what and it’s not going to satisfy your craving for a “clean” color scheme, it’s just going to feel earth toned. Also, your kitchen is much more pinnable as is. Your white kitchen was on trend at the time and you jumped off that at the right moment. The Iron Ore is quite dark for a kitchen and I can see how it might start to be a bummer, but I think painting the window trim white would make a huge visual difference. I never thought the Iron Ore really belonged around the window trim anyways and it may be absorbing some of the cheerfulness you would feel in real life looking out the windows. Then consider painting over your cabinets in a navy blue with just the right bit of actual blue tone in it for cheeriness. It’s on trend an keeps the whole color scheme in your kitchen/”handsome” house while being much brighter and happier than the Iron Ore. Yes, my thoughts too. I think an on-trend blue would be a fun solution, although I was thinking lighter than navy in this case. But, you have great taste, Emily, and I’m sure whatever you pick will be great. I agree with Catherine about the window trim. As a fellow PNW girl, I don’t know what took so long to paint all my trim white. Glory days. So much brighter. I think that dark window trim is absorbing your light. I like everything you suggested. I would go with Shitake – my good friend just painted her built-ins and they look fabulous! Its a great color and I think would lighten the space as well as go with the counter. Not sure if there is a concrete skim coat out there though. Good Luck. I look forward to the reveal! Do it!! IMHO it must be the med/dk gray in the granite which, on my screen, looks closest to Fawn Brindle. Which, I am guessing, it taupey enough to bring in the floor. Good luck! I didn’t have time to read all of the comments, so if this is repetitive, please forgive me. You mentioned that maybe you wanted to skim coat your countertops with a concrete like finish. Jenny Komeda did this to her laundry room and kitchen counters and it looked fabulous and relatively easy. Search for countertops on her website Little Green Notebook and you should be able to find it. I keep thinking agreeable grey…or is there a white that is two steps lighter than the walls? I have used Agreeable Grey in many of our rooms on the wall. To me it looks best in rooms that don’t get a lot of sunlight. I used it in our kitchen, which faces west and gets lots of afternoon light. For some reason in the kitchen it has a slightly blue cast which I don’t love. I know whatever you choose it will be beautiful! I like whatever the third paint chip is that is in the first picture you show us. I can’t make out the color. Don’t go too light because….kids. Otherwise, happy painting! Have you thought about additional lighting to brighten things up? I have tried a beige-y color that had red in it (someone suggested this). I did NOT like it! It felt like cheap liquid makeup on my walls! I think painting the island first is a great idea, whatever color you choose! My vote is Mega Greige. It is the warmest and darkest of what you have. I think the others look a little tooo beige. I’m such a fan of your blog and your fantastic style. I’m picturing the cabinets in white. We used BM White Dove and it’s such a nice, soft white. Good luck! Anew gray or agreeable gray..I think the gray tones look better. I like the idea someone proposed painting the island first to see if you like it. We LOVE Revere Pewter. Did our walls in a velvet finish with white trim. It’s gorgeous. But I may have looked at the Mega Greige if I’d seen it. We have a built in black buffet in the room. I love the direction you’re going and judging from where you’ve been and gone all these years, I’m confident you’ll pick something stunning without much effort! I’m with everyone who says maybe paint just the island first? Though I am not gonna lie – I looked a post of yours recently and was thinking it looked a bit dark in your kitchen. I like light and bright with a. It of color so I’m probably no help to you. Whatever you decide I am sure it will look great! FYI in your photoshopped photos you’ve made your current kitchen much cooler than the photoshopped version – making me wonder if you are wishing you had a cooler undertone to balance all the warmth in there? I think it’s the dark tiled floor that is causing the trouble. The natural rug under the table (even in the untouched photo) makes a world of difference to the room. I agree. The tile is what’s making the room feel a bit dark and cold. It’s a more expensive fix, but wood or a wood-look tile would brighten and warm up the space much more than painting the cabinets. That is for sure an upgrade we’ll make – but we will do all of the downstairs floors wood and that requires removing the wall between the kitchen and dining room first – so floors have to wait until we are ready for the full remodel . To simplify, I think I’d paint cabinets and trim to match the Shoji White walls since you have three different patterns and finishes in the floor, counter, and shelves. If you want to go light, go light. Especially if you’re willing to redo it if it doesn’t.work. I’d use the lightest color and do the cabinets and island the same. I think it will look restful to have it all the same. If it ends up being too light you could always knock it down with a pewter glaze. Good luck with whatever you decide! I suppose others have said this, but I might just do the island. You don’t have uppers to bring down the room. At the very least, paint the island first and then see. You might be able to stop there! Good luck. I know it will be beautiful whichever way you do. I actually like the Anew Gray the best. What about just doing the shoji white on the cabinets as well? There are already a lot of different textures/patterns going on so it might simplify it and give it a nice clean look. Always love to see how your projects turn out- good luck! Do it! I love the dark cabinets, but I painted mine a greenish taupe and love them! My main reason for the color that I chose was to go with my current flooring too. 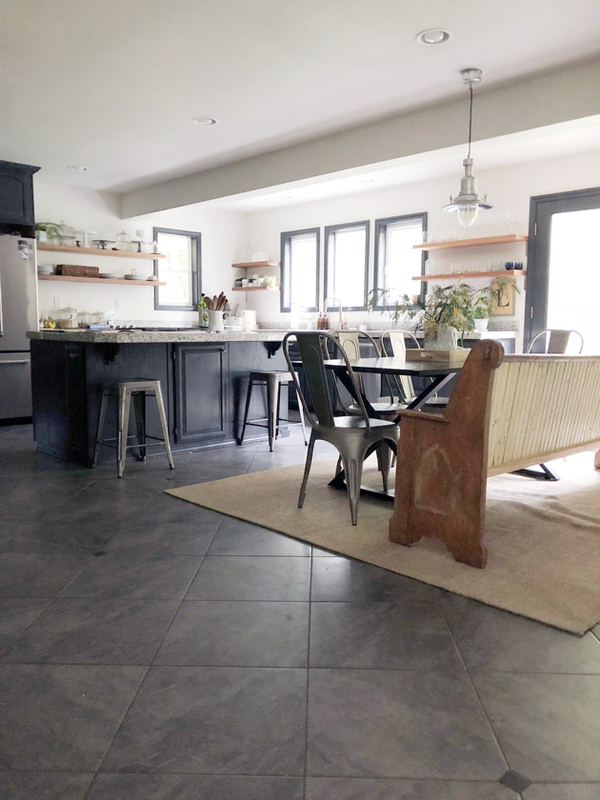 My kitchen island is a nice gray/taupe color that warms the place up – I have white ikea cabinets that I love but you see every spill – you may want to lean towards something more forgiving. It will be great regardless! This is such a timely post for me! I’m adding a kitchenette to our basement teen hangout room. The room has limited natural light and grey, stained concrete floors. I had originally planned on black cabinets with a butcher block countertop. I was going for a moody, industrial look. I’m now rethinking my decision. Obviously, it’s not like an everyday kitchen – but your observations are making me pause. Of course, it looks great in my renderings! I might go with white cabinets, butcher block and add interest with dark wall paint (which is so much easier to change). Thanks! Have you considered painting the island only? That might lighten things up but you can still maintain the drama that the dark cabinets project! My island is lighter than the cabinets and I like the contrast! Whatever you do it will be beautiful! Love that you’re changing things up! Personally I love the white on white look for cabinets and walls. I think it creates a calm and the unique features will stand out, like your beautiful wood shelving. I have white on white and I think it makes my plants become a focus as well as our view outside abs some of our unique pieces in our home. Good luck!! I have very similar counter tops and we painted the Repose Gray from SW. It is more muddy than the Agreeable Gray and it lends itself to matching both the gray tones, and the metal brass tones in the room. Not quite at blue/Gray as agreeable. I find Repose to be incredibly neutral. We had repose grey in our last house & LOVED it!! I would start with painting your island. Don’t really have a preference on the colours. If you like it you could continue on. While I like the dark trim I think it might be adding to the dark feeling. My eye just kept going to Anew Gray and then that didn’t make the cut! I would put that back in and choose between that and Accessible Gray. if you are wanting to lighten it up, lighten it up! In our former home – a loft – the walls were anew gray. I painted our bar mega greige thinking it would be the same hues but a shade darker. To me the mega greige had some pink undertones when you looked at them side by side. The walls were flat and the bar was enamel, but I don’t think that was the reason. You can see the end of the bar next to the wall color in the first picture here – https://beacham.com/listings/fmls-5726833-1878-gordon-manor-ne-atlanta-georgia-30307/. My new home is painted in agreeable gray. I wanted a little lighter gray this time because we don’t have as much natural light here. I’ve been happy with it. Have you considered painting your floor? I’ve seen some pretty things painted on the square tiles on Pinterest. I think it is the floor that is making it seem so dark. I would love to just rip up the floor :) I’m not sure how great painting it would work – we are hard on our floor. I vote Agreeable Gray!!! It’s such a great color and, like you, I am a fan of revere pewter for all its taupy gray goodness. I love the interest that the trim color and lighter cabinet color create. I agree with you…a space needs to feel good day in and day out. Why don’t you just paint the island and see how you like it and go from there? I totally understand the need for change. I am a kitchen and bath designer….I want to change what I have every 18 mos-2 yrs . Of your final four, I like the Agreeable Gray. It’s a bit more silver than the Revere Pewter, which seems to take on a greenish hue everytime I have used it. You also had Anew Gray that didn’t make the final cut, but I have found it quite easy to work with. I tend to like my grays to have a brown tint though. Good luck choosing, and I will be anxious to see the outcome! I was immediately drawn to the Anew Gray, just like Kathy and Julie! Oh, I was so sad to see the headline of this post–that is, until I saw the photo. I get it now. Your kitchen is one of my absolute favorites, but I wouldn’t be able to handle the darkness, especially since it’s often overcast in the NW. So I vote for Agreeable Gray! I think that’ll look better with the wood shelves. But I know I will love whatever you choose and can’t wait to see it. LeAnne, who is so inspired by your fearless painting! i just painted the exterior of my house agreeable grey and i loooove it… very light though! and more beige than grey! We redid our 30 year old kitchen cabinets in a 2 tone: Creamy white (cant remember the name) on top and Mega Greige on the bottom. I love them! We also painted our kitchen walls Agreeable Gray. Both are [gray]t colors. Hehe. Right next to each other Agreeable Gray looks like a lighter shade of Mega Greige. Complement nicely. If I could post a pic on here, I would! The Mega Griege is the warmest, for sure, so that may be the cheeriest option. And if you’re getting rid of the speckle-tops, you don’t have to worry so much about matching them. Excited to see the cabinets lightened up! I was a silent minority who always though they looked too dark with the dark floors. But I’m not a fan of black/super dark kitchen cabinets anywhere, so I know I’m biased. Loved your first kitchen, and am looking forward to seeing what you do. I agree with the PP who says paint the island something different from the other cabinets! Well, I was shaking my head at your crazy idea until you showed the kitchen in it’s a true oolors. Have you thought about refinishing your countertops with a kit from Rustoleum? If you changed the countertops,you could pick a color you like and not just one that would go with the current colors. But before you paint….Yes! They do do a thin concrete countertop coat. It’s called feather coat concrete by Ardex there are tons of tutorials from bloggers if you search. I have seen mixed results but might be with it. What if you just painted the island cabinets lighter? that would lighten it up with out redoing everything. I like the Revere Pewter or Shitake. Good Luck! Cant wait to see it! What lighting exposure do you have in that room? That will make a difference too. I picked what I thought would be the perfect taupe years ago and when I painted the east facing living room people commented on the “mauve” color – NOT what I was going for. Exposure, as you know, is important. Sorry the Iron Ore didn’t work for you – it looks soooo amazing in the photo’s. You find the right color for you – you have great taste! I think you should hang a farmhouse light above the island in bright canary yellow! Totally change the feel. I might be odd man out here but I think you should go whiter! Maybe even match your white walls. I love a white kitchen and I don’t think you are going to get the brightness you want with those greyish colors. Just my opinion! I was drawn to Shitake! I think it will look great and much brighter! I do like the idea someone gave about leaving the island dark! Good luck! We went with Agreeable Gray on our bedroom walls when Revere Pewter ended up too dark for us (we don’t get a lot of natural light in our house). It was making me crazy because when I painted them both on a piece of white paper, they were virtually indistinguishable, but the Agreeable Gray turned out much softer once the entire room was painted. The Revere Pewter really deepened, especially in the corners. All that to say…I love Agreeable Gray, but if Ryan feels the Revere Pewter is too light, I think he’d find the Agreeable Gray even more light. My eye kept going to Rushing River. My eyes are drawn to that shittake chip. So warm yet bright! We have white kitchen cabinets. My kitchen faces north and I painted a dozen different colors on the wall and couldn’t decide which to choose. The painter walked in my kitchen and said “agreeable grey”. So I went with it. We painted our walls agreeable grey. I love agreeable grey. I love it so much that I called the painter back and had him paint my den and living room agreeable grey. Then I took my kitchen hutch to the garage and painted it agreeable grey. I would love to send you a pic of the painted cabinet. Is that possible for me to do? I live in Seattle n I understand the need of having light..:)…we went for all white kitchen cabinets and white speckled countertop in quartz..couldn’t be more happier..I would suggest you to go a shade or 2 lighter or go white..:).. I love the agreeable grey..we have it on our walls n it changes color depending on how much light we are getting that day..its a beautiful2 color..
My favourite is Anew Grey! Yes there is a product to cover counters with a concrete – Skimstone! The shop I work for in Couer D’ Alene teaches classes on it! I’d yohre interested in the product I can try to pull some info for you. We moved to Spokane from Denver a year and a half ago and I have a brown kitchen and I totally know how you feel! I would say, go as light as you can to help your poor, sweet, self! My kitchen makes me sad and grumpy with all the clouds, and it it next on our project list to paint! The Fawn is too pinky brown (at least on my screen) and the shiitake also seem pretty brown. I would go with the lighter gray or even the Revere Pewter. I have my whole family room in that color and we have a huge window at garden level. I feel like it’s the perfect combo of warm and cozy at night and light/bright during the day. Now that I see that Fawn, I’m wondering if that’s the color that’s in my Master Bath? Good luck! A chandelier over the kitchen island would add some brightness! 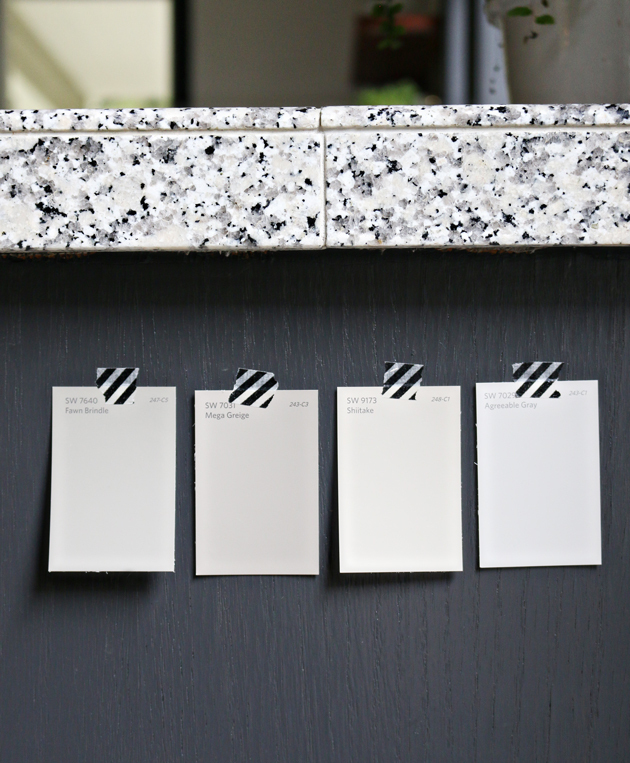 I’d paint the cabinets and trim the same as your wall color since you already have 3 different and distinct finishes in the granite counter, dark floors, and wood shelves. Mega Greige… solves the problem, brings out the speckle but still gives you the different you initially wanted. Can’t wait!! I also like the idea of keeping the island Iron Ore and painting the other cabinets a light Greige. My eye keeps going to Anew Grey in all of your pictures. I agree with Elizabeth that a color with a blue base would be bright, and help tie in the floor and trim. However, I love blue and the bright, happy, calming feeling it gives me. I’m over in Seattle. We live in a daylight basement and I totally get you with dark spaces and dreariness! Lol! I’m excited to see which way you go and to see the final product! Fawn brindle! The undertones go well with the cool grey in the countertops, and I think the Agreeable Grey too light. The wood tones will go well with the Fawn as well. I also live in the Seattle area and the dark weather is driving me insane, too. We’ve had an awful spring! I think you will be so glad you did it. Your kitchen is beautiful! I like the Anew Gray for your cabinets, which looks a little darker than Agreeable Gray. Also, you mentioned BM Revere Pewter. The BM color just lighter than that is Edgecomb Gray, which is a gorgeous Greige. You should compare it to your SW colors…it might be the perfect way to lighten up your kitchen. We used it in our entire house to lighten up too dark and too taupey walls. Ah! Just scrolled back up to the top and love your new photo! 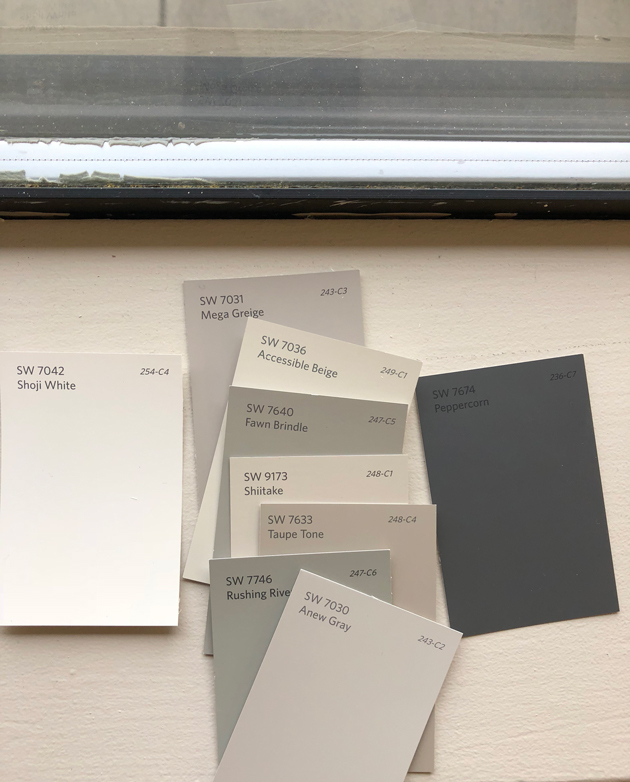 I am partial to Anew Gray — Probably because it’s the color we selected for most of the walls in our house. I get comments on it all the time, and it really is the perfect color between taupe and gray. I’d recommend it! I don’t think you could be disappointed. You may not even dislike the speckled countertop as much with a slightly more neutral color :) Happy painting! I love seeing your posts! Totally support your painting plan! :) Our kitchen has the least amount of natural light in our home, and we went white with the cabinets (we have a similar speckled granite that is also not my fav). It definitely helps the room feel brighter. I vote painting your cabinets white. Maybe search on pinterest for kitchen with slate floors and white cabinets? I think it will give you some inspiration! My initial response to your colors was Shiitake. The Shitake and Agreeable Gray are my favorite. Wow… the online samples are much darker. From the store chips, I like the Agreeable Gray the best. It’s a nice light neutral. I’m in a similar sitauon. Our current cabinets are a natural pecan and the granite is too busy with lots of warm hues. We get a ton of afternoon sun in the kitchen, but it’s still so dark. Contemplating painting the cabinets, but I know it’s going to be a pain. Good luck! Can’t wait to see your finished project. I have a cabinet in my living room painted Revere Pewter and I LOVE it! It has a surprising warmth to it. However… I think you might want to go a wee bit darker than that… when you had all the chips on the counter top I thought the Fawn Brindle was an amazing match. And would be perfect. One SW color that we have used a lot in our decor is Useful Gray. It’s light and bright and soft. It seems to be happy with warms and cools. Of course I have no idea how it will go with your counter… but I’m throwing it out there for you… just in case. If you’re looking for that mid-tone… my vote is Fawn Brindle… hands down. I think it will stay with that moody look you like without turning your kitchen into a dark hole. And given the other moody colors in your home I think there is a fine line with too bright. I’m grateful you “shed some light” on the true darkness of your kitchen. I know your area is cloudy and I struggle here in Michigan in the winter so I wondered how you could stand the darkness… it would be hard for me. Lots of good comments here and ultimately we can’t decide for you because things will always look different in real life! When you put the swatches on the counter the mega greige and shiitake seem to match the counter tones best. I liked the suggestion to keep the island dark, which might help to offset the dark trim. We’ve just moved to a new rental and the kitchen has orange varnished pine clad ceilings which is making everything feel dark. Need to see if the landlord will allow us to paint it, and whether I can be bothered to a)spend the money and b) do the work. I think it will make a great difference though, even if we only end up being here a year. 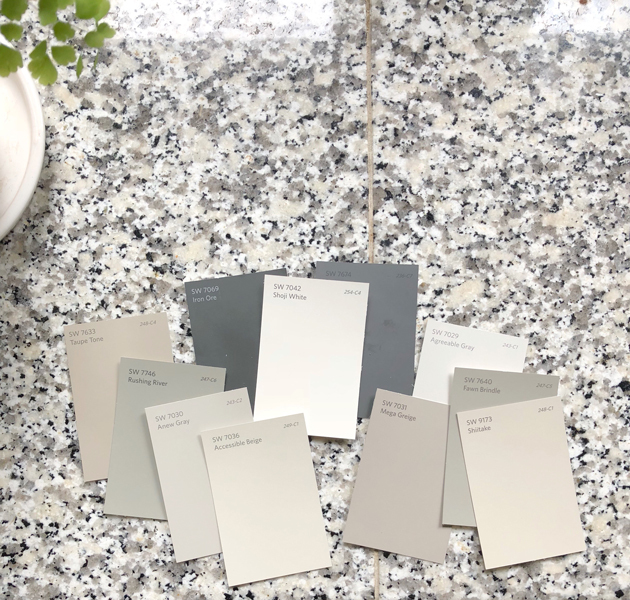 Looking at all the paint chips against your counter, it looks like you might want to reconsider Rushing River alongside Fawn Brindle—these look like the closest matches to the medium grey speckle. I must say, I don’t find light lower cabinets all that practical…in my house, they water-, ketchup-, and tea-stain like nobody’s business. Then again, as others have noted, repainting white might be a useful dress rehearsal for your remodel, and you get to see if white does what you want in that space before you spend buckets on a kitchen reno. I really like the Mega Greige (I like the color on the paint chip vs. the color from the Sherwin Williams website). It seems to go well with all your other colors and pulls out the darker beige in the speckled countertop. I also like Shitake, but my fear is that it would be too light with the dark trim and dark floor and possibly not the right mix with the Shoji White (not exactly the same and not enough contrast). Mega Greige just seems like a happy medium. Again, I’m basing this strictly on the color chip colors and not the website colors since the website colors are so much darker. There is a bunch of good advice here in the comments…I agree with everyone who suggested to go as light as you can in your choices. The greige is too muddy and will not give the result you are looking for. I think you will love lighter cabinets! You are happy with Shoji White on your walls, so try painting one or two shades darker on your cabinets? Worldly or Amazing Gray. This way there would be a flow with the undertones. I wouldn’t worry about the floors – gray is a neutral. You do such a great job of accessorizing that you can pull the gray up. I liked Anew Gray or Agreeable Gray! What if you got darker hardware (thought I know that is more expense), but it might tie into the dark trim? Love the warm grays. What about leaving the island the darker color with the cabinets around being a warmer grey that you chose? My thoughts exactly. Then the dark window frames will look okay. If not, you will be painting them before long. What about a lighter shade of the current color? A gray/blue may look nice since you don’t seem to love the beige/taupe and would still brighten things up. I think it’s a really good idea to paint the cabinets less dark. It doesn’t only brighten up the kitchen, it also brightens up your mind. There was an example called Rushing River, I like that a lot. Succes with choosing your favourite color ! 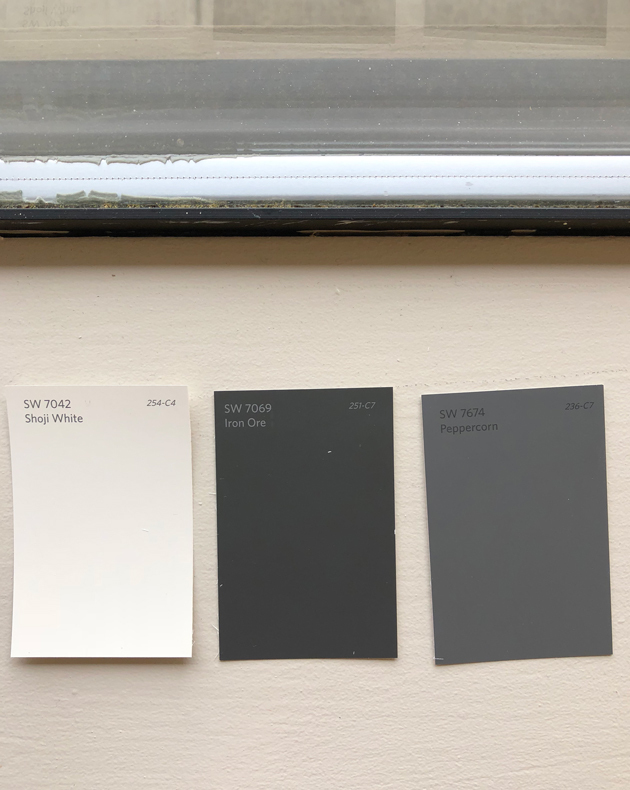 I would go with lighter paint (like the agreeable gray or revere pewter)…our kitchen and living room (both in the back of our house) are dark (we live in the south but have a very shaded yard/house). We painted our cabinets and our fire place white and it made a HUGE difference in lightening the space. I understand not liking living in dark space! I would go for it! Sorry to add one more thing, I know you want to narrow it down but did you consider SW Amazing Grey? It really is amazing. It’s light but not stark/cold and it picks up whatever is near it…so it looks either grey or else taupe/tan. It looks great with both white trim and wood tones. It really is awesome. We just built and our designer highly recommended it and we love it. We painted our rental home in it as well. If your walls are whiter it might be nice on the cabinets…. Check out Jogging Path (SW). LOVE that color and have used it a lot on cabinetry and built in shelves. :) Its just a great color. Could you only paint the island lighter and leave the rest of the cabinets? In your dark/dreary day photo, it feels more like the island that is darkening up the room. What about painting the island and just live with that for awhile. I’m partial to the “Anew Gray” I know it didn’t make your top 4, but that one kept jumping out at me. I did not return with the photo without editing! And I understand you! A kitchen is a place where you spend a lot of time as a mom! For the color I would go on a beige with a touch of red to warm it. In fact the tip of red will warm the beige and approach the copper handles and wooden shelves. I would leave one of the beige we see on the work plans. We had done like that a year in our first apartment. We did not want to change the floors, the tiles had many colors! We started from the clearest to lighten the room. The picture with the painting chosen at the end of the post seems good to me. On Insta I left you a message … I advised you to paint with the new color the furniture of the island. And wait to see how it works with the rest. You could avoid repainting everything to test and get used to it without changing everything at once. If that did not suit, there would be only the island to repaint! Good luck! I design a lot of kitchens and while I like Rushing River and Fawn Brindle my favorite cabinet color is Dorian Gray by Sherwin Williams. 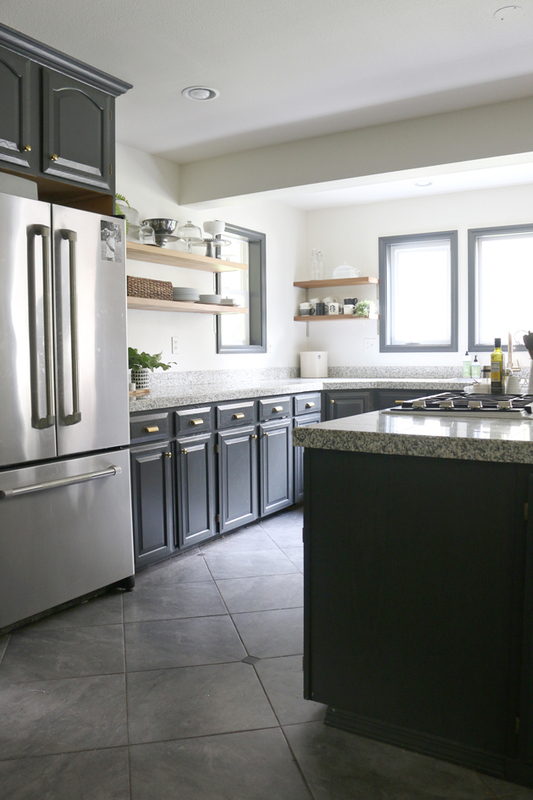 I would discourage you from going with Agreeable Gray, while it is an absolutely beautiful wall color it does not translate to a great cabinet color because when you go with a semi gloss sheen for cabinets it tends to look very white and not rich like it does in a flat sheen. I love your dark cabinets and Iron Ore is a favorite of mine but, I can understand wanting a light and bright kitchen. Enjoy the process, looking forward to seeing what you decide! Love your idea to go lighter! If you love to paint then go for it. I on the other hand do not and Im not good at picking colors either! Cant wait to see the finished look! I’ve come to appreciate there is a real art/skill to picking color, and I don’t have it. (I am at peace with that) I do however fully support the concept of knowing what you know…which is the kitchen needs to be brighter for you. Paint on! I like the Fawn Brindle! Just feels calm and lovely. I like the Agreeable Gray. It always look darker on than what our eye sees with the tiny chip. At least that’s what I’ve found over the years. So if I like a color I go two shades lighter in the same color family. Do you use a special cabinet paint? Are you brushing it on or spraying it on? Curious because I need to paint a kitchen island. Thank you. Whatever you do will look beautiful. I will do a post with cabinet painting tips once I do it! I like Shiitake or agreeable grey. 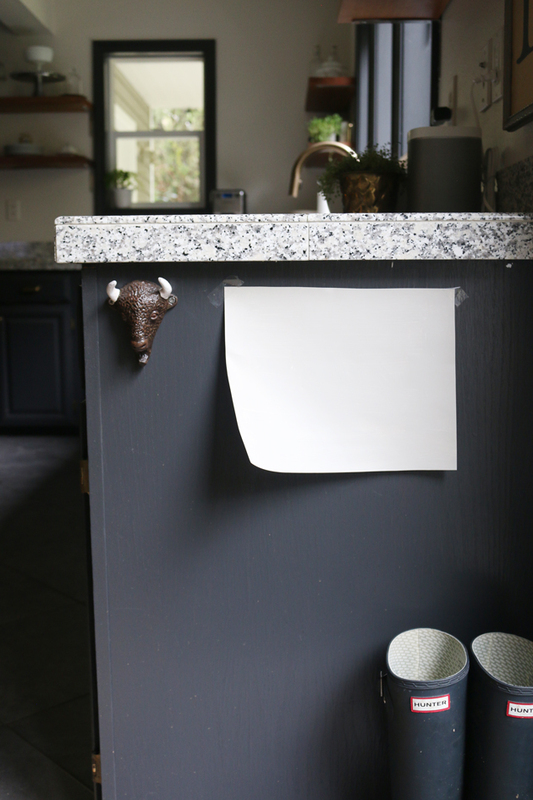 I have the same dark kitchen problem – I painted the trim a masculine dark blue when we moved in (I plan to paint the cabinets, but also I just want to take them down, so why paint them…?) and then after last winter I repainted window trim over the sink a much brighter blue and it has become the accessory color in our kitchen and I love it so much. Up here in the PNW we have to make our own sunshine for most of the year, so I wholly endorse this move. And also I love painting, so I understand that. I think it’s a great idea, but I do not recommend Mega Greige. I just used it and feel like it would be too dark. I’d go with the lightest choice! Could you share details about your go-to cabinet paint? I would like to repaint mine, too, but I’m overwhelmed by all the choices people recommend. Love the idea of the Revere Pewter or the Agreeable Gray. The Shiitake appears too yellow next to the other colors. You will love going light. Is it me or does everything look more beige in the photoshopped picture vs. the current colour. I know you didn’t ask for advice in as such, but I’ll just give my opinion: Seeing as you are so fond of the whole gray-beige scheme, I’ve noticed that you always like to put in some green with. Therefore (since it’s not forever) I think you should try on some different greens (my favourite) and maybe blues. Go back to the paint store and think outside the box :P !!! Hi! I painted our cabinets alabaster and walls are intellectual gray. I love the brightness of white cabinets! You won’t regret it even though it’s a lot of work! :( Iron ore is beautiful. Mega greige is a funny color, be careful with it. I don’t think you’re going to brighten, but muddy. Put all the colors too close together and you have zero interest. I thought the photoshopped color was too dark. This was a fun post to read—I love knowing your thought processes! You inspired me to paint my cabinets from your original painting! Funny, I originally was going to go dark, but felt like I was going to miss that trend because I fully intended to degloss, sand, etc. etc., so I wanted to really take my time. I just got started this past weekend and landed on a light neutral. SO, to see you going in this direction too makes me super happy! So John and Sherry from Young House Love did a concrete skim over their original counters in their current home! I don’t have a link to it but it’s definitely do-able! I feel like the shiitake is pulling a little yellow and the mega greige is pulling pink from your photo. I like the ones that seem more gray. I agree. Thanks for your help! Emily, how about changing the color of your island cabinets first. You may find that gives you the change your looking for. Your wall cabinets are striking. Ardex Feather Finish…..Amazon Prime. It’s is the easiest and cheapest way to get the concrete look. We have done a laundry room, a kitchen and my shops check out counter and it’s soooooo easy! Emily…I wished we lived closer. I have all of those color samples and so many more for you to try!! I love to buy the mistints at my local Sherwin Willams so I have a collection of sample quarts. When you first mentioned repainting and put up the swatches, I picked Rushing River because in the pics it seemed to match that taupe-y color you were trying to bring out. Fawn Brindle would be my second pic…but I think it would all depend more on the floor than the counter tops. I feel Agreeable Grey will be the winner, though. Go with your gut, girl! So far, we have loved everything you have done. So Paint, Paint, Paint Away!!!! And take lots of pictures! When you put the chips on the cabinet, I am drawn to Mega Greige, but when you put the chips on the counter, I like the Fawn Brindle. Tough decision for sure!! I guess, given the fact that you love to paint, if you hate it, in another year and a half you can repaint!! :) No matter which way you go, it will be amazing! I just painted my family room, dining room and foyer Agreeable gray and I love it! It would be a great choice. I used to have dark pecan paneling in the family room and the paint has lightened up our room so much….big difference! Have you thought of BM Decorator’s White? It reads more grey color in person and might be a good fit? Our living room walls are Revere Pewter and the color is so muddy. Even though we have good natural light the room feels claustrophobic. Planning on repainting and trying to decide on a color all over again. Hi, I also chose Revere Pewter for our livingroom, started painting the walls and it was too dark for me! Loved the color though, so I took white paint and mixed it with RP and painted poster boards till I found the right lightness. Then had the paint store color match it, and I absolutely LOVE how it looks on my walls! We have an open concept floor plan, so Have it in the kitchen, dining, foyer, living room, laundry room, and the hallway, and like it in all settings! Just throwing that idea out there, if you like a color but it reads to dark! I agree with having your island different. I would leave it how it is now to match your trim & go with the Fawn Brindle for your other cabinets. I’m excited to see your end results. Good luck. I agree with Jeanene!! Was going to say the same. I love the fact that you want to repaint and brighten your kitchen. I like the Fawn Brindle out of your choices but if you’re going with new white cabinets one day anyway, why don’t you paint these white? It might help you see what it will look like when you get your new ones and if you really want to spend the money on all white cabinets. :) you might change your mind. Better now than later, right? Maybe keep the island Iron Ore and paint the cabinets? I can’t wait to see the outcome. I like the first 2 (on the left) best. I like the Fawn Brindle next to the counter tops. I can see the Shiitake looking really nice too. Depends how light you want to go. I like that you feel free to experiment and try things, then change it up if you don’t love it. That’s great! Have fun trying something new. I’m sure it will be pretty, whatever you do choose. I have revere pewter on my walls and white cabinets. I do love the combination. But be warned that the revere pewter (we matched it at SW) is darker than the paint chip. I like the idea of white cabinets and leave the island dark. I think if your kitchen is darknif you only lighten the cabinets by half you will still feel like it is dark. Or just do a new color on your island and see what it feels like. Good luck. I love the shiitake! I liked it from the 1st pile on the countertop before I saw it was one you had narrowed it down to. Good luck! would you consider a slate blue for the bottoms? Have you tried a gray with a blue hue instead of the taupey gray? Might help you love it a bit more? Choices, choices! I like the Shiitake color. What about painting the cabinets white, the same colors as your wall, but leaving the island dark? Can’t wait to see what you decide! Last year I painted all of my cabinets the wrong color and had to repaint them. Why? Because the color looked like stainless steel. Who wants stainless steel cabinets? Put the color samples next to your frig and that should help a lot in your decision making. I think you should do the brightest / lightest one. The greys that are darker next to the floor and granite just make everything feel blah. Much better than the dark, day, gray— go lighter— so much better and for the window frames too. Good job . . . . I would try it in my kitchen, but the thought of removing all the cupboard doors etc. did you take them all off and the draw pulls etc? Emily, I live in Vancouver BC and like you, it’s dark and dreary here a good portion of the year. I’m a neutral decor lover and when we moved into our current home 10 years ago, I went with more decor/furniture in black. I lived with it for a few years and eventually replaced/painted everything white, I couldn’t live with the darkness any longer. I totally get where you’re coming from. I think going back to white may be the solution here. I love the color choices. :) I would do the island first. I’ve seen it done in brand new kitchens where the island is done in another color. That way you haven’t invested too much time or money if you hate it. I really like your dark cabinets but understand why you might like it too be a little lighter. I love how you painted your kitchen a colour, other than white. I like a white kitchen too but felt it was the wrong colour for my house too! I have gone with a grey, taupe beige colour and I love it. It makes my kitchen feel calm, soft and inviting. Everyone comments on the feel of the room when I have guests. All the best, I am sure you will make a great choice, you always do! My kitchen is dark too. Just paint them white! I think it is great you have decided to go lighter. If it will make you feel happier and your kitchen lighter and brighter I say go for it! You are in your kitchen daily so a light, bright space is important. In our last house we completely remodeled the kitchen with beautiful, brand new dark cabinets. It looked amazing and helped the house sell fast but I did feel it made the whole space dark, so I totally get what you are talking about. As for color you would know better than me. Good luck and I can’t wait to see the results!! Lukewarm is no good, keep playing in photoshop until you love it. Love the Iron Ore but if you feel you need a change go for it. I like the shiitake along with the mega greige. Have you thought abt the Peppercorn or would that be too monochromatic even though it’s lighter? We have SW Agreeable Gray on our main living walls, and Shoji in our kitchen, so I love that palette. I want to paint our kitchen cabs in a major way. (They are unpainted Oak from when we moved in…not bad, but need to lighten up.) I have never painted cabs before, so trying to build up the nerve! Can’t wait to see what you decide! I like Shiitake the best. Have you thought about leaving the island the color that it is? I have white cabinets with a French blue island and I love that bit of color. I think the Fawn Brindle would be gorgeous on your cabinets! And go for it–it’s just paint! Do it! Crazy question. Why not something like a bold, electric blue? Thank you for sharing which white you used to paint the walls. I want to paint our kitchen walls a creamy (but with zero hint of yellow) white. Shoji is a color is be interested in! I JUST finished painting our kitchen cabinets Revere Pewter, and could not love them more! The cabinets are original to our 1949 kitchen, and have been painted many colors over the years. A year ago I painted the uppers white and lowers dark blue to experiment and see if I like two tone…. NOT in that kitchen! So in love with it now. I also just finished painting/stenciling our kitchen floor, which is not our forever floor. Painting tile is a thing, you know. You could do a concrete tile-like stenciling, which is what I did on our wood floor. Check it out @larladawson on instagram.